The origins of Grado can be traced back to the Roman times and the name of the city comes from the Latin word of "gradus", meaning military stronghold or point. In fact, Grado has always been a stopover for the roman ships navigating upstream on the Natissa River, towards Aquileia, which used to be the most important eastern city for the Romans and the center of the Tenth Italian Region of "Venetia et Histria". Grado was initially a Castrum (stronghold) surrounded by walls, an area which nowadays corresponds to the historical center of Grado. Later on, after the barbarian invasions, Grado was constantly inhabited by the local populations who used to run from the peninsula in order to defend against Attila the Hun and its hoards. In the year 568, the archbishop of Aquileia, who was under the Lombard threat, tried to transfer the Episcopalian Center to Grado and to proclaim himself Venetiarum et Histriae Patriarca, but failed and the Church Center remained in Aquileia. 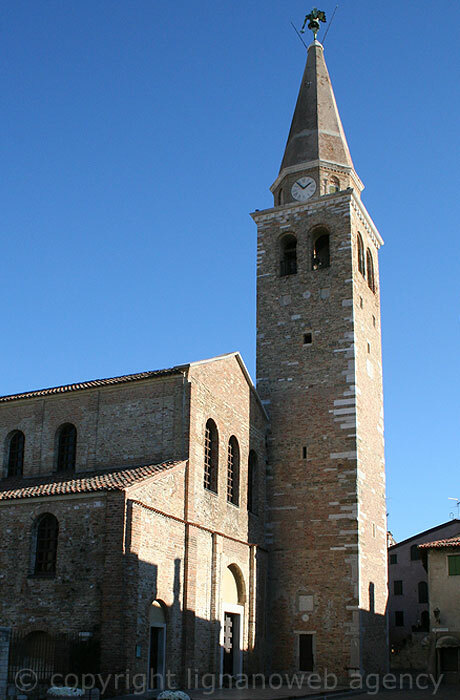 Patriarch Elia of Aquileia was the one by order of whom the construction works to the Bell Tower of the Cathedral of Santa Eufemia (Campanile) completed.